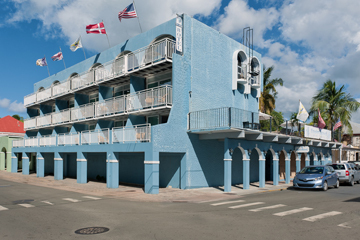 The Frederiksted Hotel features old world Danish architecture. We're a modern, practical, small, family owned inn with personality. Travel, even business travel, can still be an adventure. Experience the essence of the Caribbean. There are some great photo opportunities. We offer a breezy, palm-lined courtyard, which is a perfect retreat for dining (full breakfast, lunch, and dinner). Enjoy authentic West Indian cuisine created in the restored historical kitchen, first used in 1831. Comfortable seaview or poolview rooms have cable television, air conditioning, telephone, microwave, refrigerator, and local artwork. Enjoy the pool and sundeck where you can see spectacular sunsets. A dive and snorkel shop are on the premises. Business traveler services are available. DEPOSIT POLICY: Credit Card at booking will serve as deposit. GUARANTEE POLICY: Credit Card required at time of booking to guarantee arrival. Minimum 1 night's deposit required if credit card not available. Send deposit ot hotel in listed currency (certificed check) before arrival.